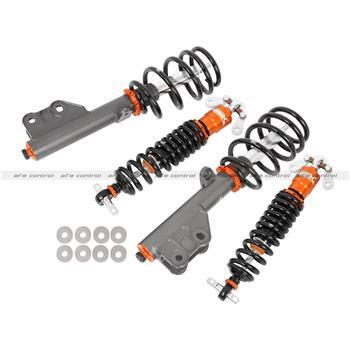 aFe Control is proud to release the Featherlight Adjustable Street/Track Coilover System. Both ride height and damping are easily adjustable in this design allowing for fine tuning the Mustangs stance and ride quality. Packed with features, the coilovers are precision CNC machined from 6061-T6 aluminum hard anodized and assembled in our Corona, California production facility. The mono-tube construction utilizes a floating piston to separate the oil and nitrogen gas allowing for predictable handling and a consistent feel. Since the coilovers employ double digressive valve technology, the easy touch rotary knob will adjust both compression and rebound in one device. The 24 distinct settings on the front and rear shocks accommodate for a comfortable street feel, all the way up to track settings. Elevate your driving experience with the comfort, precision and excitement of aFe Control Featherlight Adjustable Coilovers.